Find fast, cooling relief from pain through our cryotherapy treatment. By applying ice compresses to inflamed joints, muscles, and tendons, we can reduce the temperature of the tissues directly on or blow the skin surface. This cools and constricts the blood vessels, as well as reducing nerve transmission of painful symptoms, which relaxes muscle spasms and provides temporary pain relief. 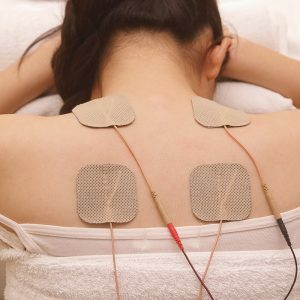 Speed your healing from acute and chronic pain with our electric muscle stimulation treatments. Using a small, electrical current applied directly to injured soft tissue or spasming muscles, the therapy reduces swelling and releases trigger points that may have the muscle locked up. This also allows the body to re-lease endorphins, the body’s natural pain relievers. Pain from joint injuries, muscle injuries and spasms can be lessened or even alleviated with ultrasound, a treatment that creates small sound waves that vibrate and massage soft tissue and muscles. Therapeutic ultrasound facilitates the body’s healing process and decreases scar tissue formation. Bring back mobility, loosen tightness, ease pain, and build strength through a daily regiment of therapeu-tic exercise. These controlled, focused movements work with the body to support areas that have been weakened, while also bringing healing circulation to the area. Partial sit ups are recommended for people with back pain. The same muscle groups are worked out without putting stress on the lower back. Start in a regular sit up position with your back on the floor, both feet on the floor, and your knees bent. Raise your head, neck, and shoulders off of the floor and hold that position for 5 seconds. This simple and easy exercise will strengthen your core. Repeat as many times as you can with a goal of increasing your reps each day. Start this exercise in the same position as a partial sit up. Begin the exercise by drawing one of your knees to your chest, using both hands (only one foot is now in the air). Hold to the count of 10, then slowly release it to the rest position. Do 4-5 repetitions, and then repeat with your other leg, then both legs at the same time. This exercise stretches your glutes and back. Start this exercise flat on your back with your arms extended out to the side. Bend your knees and lift your feet off the ground. Now rotate your hips to the side so that your legs become parallel with the floor. Rotate from side to side for 5-10 repetitions. This core exercise strengthens your abdominal muscles. Start by laying flat on your stomach with your hands to your side. Lift your head and upper body off the ground by using the muscles in your lower back. Hold this position for 4-5 seconds and then lower your-self back down. Repeat 10-15 times. Position yourself on all fours with hands directly beneath your shoulders and knees directly beneath your hips with your back straight. Use your abdominal muscles to push your back towards the ceiling, arching it like a cat. Your head should point down towards the floor. Next, drop your back so that your lower back extends. Your head should raise when doing this. Make sure to keep your elbows straight the entire time, the only movement should be in your spine. Repeat this 12-15 times. This exercise is best performed with a stability ball. Lay with your stomach on the stability ball and your hands behind your head. Tighten your abdominal muscles and use your lower back muscles by contracting your glutes to lift your shoulders and chest off the ball. Lie face down with your arms extended above your head. Tighten your abdominal muscles and lift your arms and legs off the ground. You should be in a Superman-like flying position. Hold this for 30 seconds and then release. You may be tempted to hold your breath when clenching your abdominal muscles. Don’t! Control your breathing while holding this position. Using a stability ball, lay face down with your hands on the floor in front of the ball. Raise both legs off the floor until your body is horizontal and hold the position for 10 seconds. Lower your legs back down to the floor and repeat 5-10 times. While seated in a chair, reach one arm across your stomach and grasp the opposite side of the chair. Look over the shoulder while rotating the low and mid-back. Hold for 15-30 seconds. Begin with both hands overhead holding an elastic resistance band. Engage the abdominals, bend the knees slightly, and position the feet about shoulder-width apart. Pull downward to the side with one arm, adducting at the shoulder until the upper arm is next to the torso. Pause, then return slowly to the starting position. Keep your arms slightly in front of the face to protect the back and shoulders. Start with the ball under your stomach and your hands on the floor in front of you. Roll forward slowly until your shins are balancing on the stability ball. Now perform pushups as you normally would by bend-ing at the elbow. Lie on one side with your legs straight. Support the upper body by keeping the elbow directly beneath the shoulder. Be careful not to let the top hip rotate forward, engage the abdominals and use the torso to lift the hips. Hold this position for 10 to 15 seconds, maintaining a neutral neck and spine position. Bring your ear to your shoulder. Let your neck sit in that position for 5 to 7 seconds. Same principle as the exercise before. If this exercise causes dizziness, fainting or loss of balance, stop the exercise and contact your physician. Rotate your head toward your (R or L) shoulder. Then, nod your head down and you will feel a stretch on the opposite side of which you are looking. Just hold for a few seconds and repeat.